I had the camping gene injected into me by my family pretty much at birth. Mum and dad would pack the tent every summer, rain or shine, however hard I argued for a package holiday. And so, at this time of the year when the weather warms and the evenings lengthen, I long for nights under canvas. I dream of unzipping the tent on a still dew-damp morning and tip-toeing barefoot through the damp grass to an empty beach. I want to wake up to the sound of the cuckoo. Cook sausages on a fire. Make coffee on my stove. Fall asleep to the whisper of the wind. Camping calls. The sparkling blues and secret sands of Sanna. I live in a fairly out-of-the-way place, but I felt the need for something wilder. The Ardnamurchan peninsula was just the place. It’s an inspiring land; remote and breathtakingly beautiful. We found a magical little campsite clinging to the coast near the village of Kilchoan, and pitched by the sea surrounded by thrift and bluebells. The blossom in the trees hummed with insects. I caught the rich ripe smell of seaweed on the breeze. As the sun sank into the sea and the evening slowly softened, we wrapped up warm and cooked and drank and chatted. The familiar sounds – the clatter of tin plates, the strike of matches, the hiss of gas, the low murmur of other campers – enfolded me in a glow of happiness. 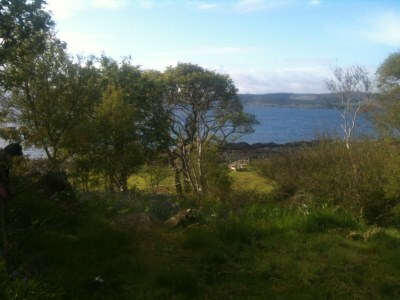 The next morning I woke to birdsong, sunrise warming the tent and the smell of bacon frying. Someone was up early. The lovely view from the campsite. 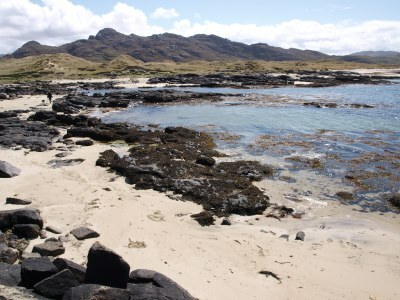 The jaggedy tip of Ardnamurchan, the most westerly point of the British mainland, is just around the coast. Stand here with the salty Atlantic wind in your face and you could be at the edge of the world. Beyond the blue and the scatter of Hebridean islands that float on the horizon, there’s nothing but ocean, vast and swelling, for thousands of miles. This expanse, this almost incomprehensible immensity, fires my heart. The emerald waves roll in, surging through narrows and rushing up the sand. They pound the rocks, angry and unforgiving. Loch Fyne seems meek in comparison. There waters are untamed and they rage through my blood. My mind soars across the waves, the cold green deep, to faraway lands.